There’s a reason many New Englanders put cheddar on their apple pie. It’s because sharp cheddar cheese and sweet apples is a downright delectable flavor combination. Add some salty, smoky bacon and sandwich it all between two slices of buttery grilled bread, and you’ve got quite the swoon-worthy sandwich in your hands. 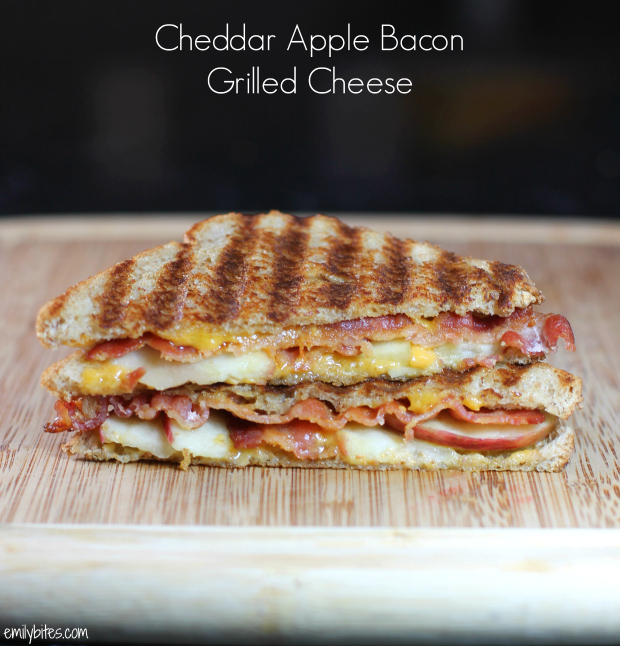 This Cheddar Apple Bacon Grilled Cheese sandwich is super fast and easy to make and perfect comfort food for just over 300 calories! I used a grill pan skillet to get the pretty grill marks on my sandwich, but a flat skillet will work perfectly well. If you want to bulk the sandwich up even further and you’ve got extra points or some calories to spare, you can even add some sliced deli turkey and make this a turkey melt! Butter one side of each piece of bread with ½ tablespoon of butter each. Place two slices butter side down on a skillet. Spread the cheddar cheese over the surface of the bread (I like to reserve a little to sprinkle on top of the sandwich filling before placing the top bread on – it helps the sandwich hold together when cooked). Top with the apple slices and cris-cross the bacon over top. Place the reserved slices of bread, butter side up, on top of each sandwich. Bring the skillet over medium heat and cook for about 3 minutes until golden on the bottom. Flip the sandwiches (carefully!) and cook for another 2-3 minutes until golden on both sides. Oh my goodness this looks amazing! Love the cheesy, apple and bacon combo! Yum! OMGOSH, I am sooooo wanting this right now. Hunger just took over me, this looks yum! Now this is the perfect grilled cheese! I bet the flavors are perfectly balanced and I love the addition of apple! This makes me crave grilled cheese! Apple, bacon and cheese – how can I say no! I just ate and how I’m hungry again- what a great combination or flavors! I am going to make this for lunch. Yum! What a perfect lunch – tons of flavor and good for you! Hi Emily, LOVE your recipes:) Just a question…..what is center cut bacon? I have looked at the packages at the store and don’t see it mentioned anywhere. Would the points plus change for this recipe if I used turkey bacon instead?? Thanks!! I make these all the time and they never disappoint! So easy, and I always seem to have everything on hand too! 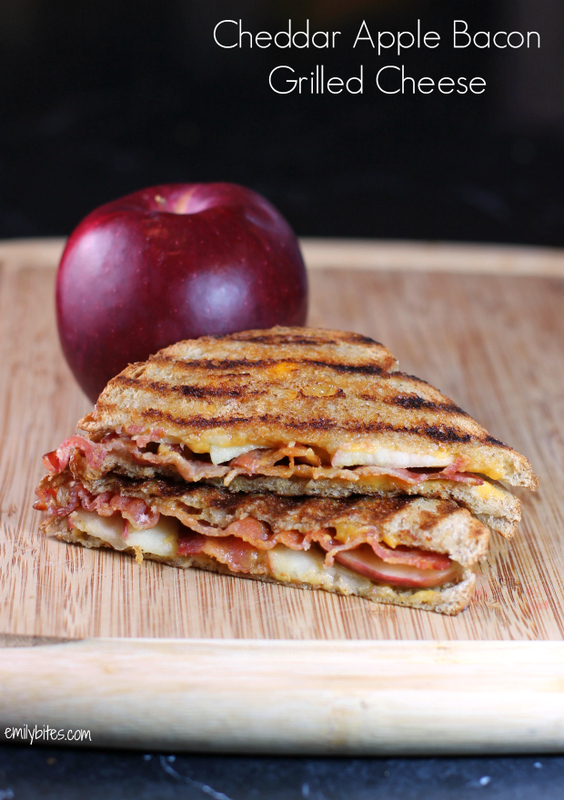 Why have regular grilled cheese when you can add bacon and apple?! This is amazing! But I did make a few changes: I didn’t need to use butter to get grill marks.. I just put it in a George Foreman for 6 minutes. It’s nonstick and slid right off on to my plate 🙂 Since I saved calories on the butter I made a Honey Dijon dipping sauce for the sandwich.